How a nation educates its children tells us much about the values of its people. 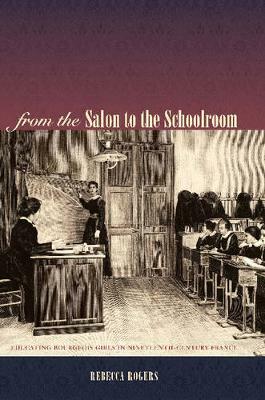 From the Salon to the Schoolroom examines the emerging secondary school system for girls in nineteenth-century France and uncovers how that system contributed to the fashioning of the French bourgeois woman. Rebecca Rogers explores the variety of schools--religious and lay--that existed for girls and paints portraits of the women who ran them and the girls who attended them. Drawing upon a wide array of public and private sources--school programs, prescriptive literature, inspection reports, diaries, and letters--she reveals the complexity of the female educational experience as the schoolroom gradually replaced the salon as the site of French women's special source of influence. From the Salon to the Schoolroom also shows how France as part of its civilizing mission transplanted its educational vision to other settings: the colonies in Africa as well as throughout the Western world, including England and the United States. Historians are aware of the widespread ramifications of Jesuit education, but Rogers shows how French education for girls played into the cross-cultural interactions of modern society, producing an image of the Frenchwoman that continues to tantalize and fascinate the Western world today. "From the Salon to the Schoolroom makes an important and original contribution to the literature on France and French women. Rogers shows that girls' education was not so much about girls as about women and the role presumed proper for them. It was about the family and the hopes and anxieties that French men and women placed on the family to reconstruct the nation in the post-Napoleonic era. It was also about men and men's roles in public and private life; about nation and nationalism; and about race and the 'civilizing mission.'" "This is a well-written, well-researched, and well-argued work. Rather than a narrowly conceived institutional history of particular establishments, Rebecca Rogers has produced a far broader, more ambitious analysis of social and familial change during the course of the nineteenth century, as made manifest by changes in the schooling of bourgeois girls." "The book is impressively and imaginatively researched." "Rogers fills an important gap in French women's history between Old Regime salons and the establishment of universal public education for both girls and boys under the Third Republic." "Rogers presents her beautifully demarcated argument in three chronologically arranged parts. . . . scholars of girlhood in any nation should find Rogers' insights helpful and can appreciate her interweaving of bourgeois girls' history with national development." "Rebecca Rogers' well-crafted and deeply researched study of the educational institutions available to bourgeois girls in nineteenth-century France intersects with a number of current debates about gender norms and the place of women in public life." "In this lively piece of writing, one appreciates the interplay between general theoretical considerations and archival investigation. Rebecca Rogers excels in describing how the structure of schools and their network relates to the formation of social and individual identities."